Weighted down by an impossible choice, King Tosarot, played by drama student Aria Inthavong, succumbs to the forces that surround him. Ramakien Remix is a creative student-inspired take on scenes from the Thai classic. This innovative celebration imaginatively combines music with moments of high drama, computer graphics with modern dance and knock-about-comedy with giant puppets. It makes for an eclectic mix designed to enthrall. Facing up to the challenges that confront him, year 10 drama student Aria Inthavong presents the role of King Tosarot in the school’s ‘remix’ of the Ramakien. Screaming monkeys and howling demons; students at Prem have come up with their own highly original modern take on a Thai classic; ‘Ramakien Remix’. Striking images of giant demons contrast with lyrical dance performances, while slapstick physical comedy competes with high-tech computer animations for the audience attention. Devised, created and performed by the students themselves, the show is staged on an epic scale, echoing the huge canvas of the original. This gives scope for art works inspired by the story as well as opportunities for original music to be composed. It all makes for an eclectic mix designed to enthrall. This timeless story of jealousy, banishment and abduction served to inspire an international group of students and allowed them to respond creatively to the culture and traditions of the host country. 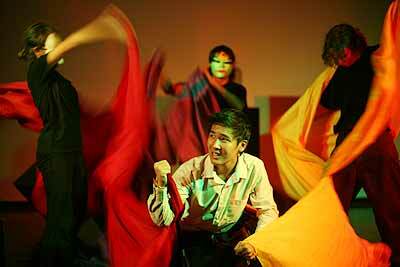 The swirling forces of fate drag King Tosarot down, performed by PTIS year 10 student Aria Inthavong. Ramakien Remix, the title and theme of this year’s Arts Festival at the Prem Tinsulanonda International School builds on a tradition of original student work established last year with collaborative outdoor production of ‘Home’. This year’s show will be performed in the school’s auditorium on December 8, 2006. The performance starts and lasts 45 minutes. 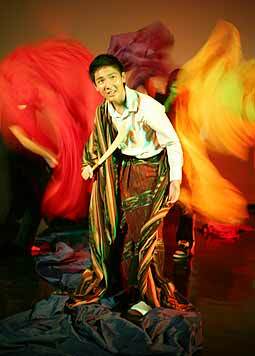 The Prem Tinsulanonda International School is developing a tradition of innovative performance. 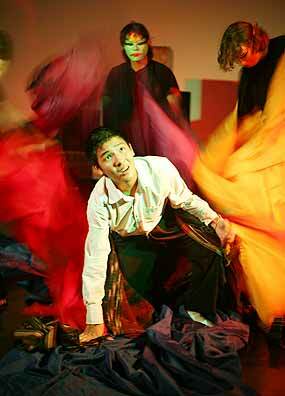 The consolidation last year of drama within the Middle Years Programme in the secondary school was a step towards introduction of a Theatre Arts course as part of the two-year International Baccalaureate. The MYP programme, introduced by New Zealander Maurice Halder, maintains a focus both on performance while also seeking to introduce students to a wide range of theatrical traditions from differing cultures. Over the year students take part in a varied programme; from devising their own mask and movement responses to the comedy of Commedia Dell’Arte. This is all reflected in this year’s performance, Ramakien Remix.